On 12th February 1951, The Manchester Guardian published a letter from Victor Gollancz (a prominent publisher and socialist) calling for people to join him in an urgent campaign against world poverty and militarism. Britain was at that time fighting an unwinnable war in Korea, and Gollancz asked all those who agreed with his call for a negotiated settlement to end the conflict to send him a postcard marked with the single word “yes”. The letter provoked a massive response. Within a month, Gollancz had received more than 10,000 postcards, and War on Want was born. War on Want celebrated 60 years since that letter was published last weekend, and while I don’t always agreed with everything that War on Want has said or the approach it always takes to campaigning, I’m grateful for what they’ve been doing for the last 60 years. Here are some of my reasons, do add yours in the comments below. 1. 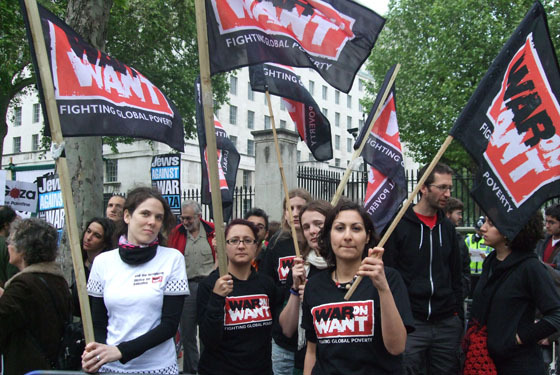 Faithfully stuck to their founding principles – Unlike most of the big campaigning organisations in the development sector, War on Want didn’t start out as a service provider and then moved into advocacy. As the story of Victor Gollancz shows, right from the start War on Want understood that ‘Poverty was Political’ and ever since they’ve been in the business of speaking out. Today they run campaigns in the UK on a variety of issues as well as raising money to support grassroots organising across the world. 2. Spoken up on issues that other’s have overlooked – Few other charities have such a diverse portfolio of campaign issues with the organisation currently working on Trade Justice, Palestine and Sweatshops. But unlike many other campaigning organisations, one of the characteristics of War on Want’s campaigning is that they doggedly stick to the issues that they’ve selected to work on even when others have moved on. For example they’re still talking about Trade Justice when charities like Christian Aid and CAFOD moved on year ago. But it’s not simply sticking with issues when others have moved on, they’re often ahead of the agenda, War on Want was one of the first organisations to start to talk about a Tobin Tax, long before governments and other NGOs were discussing the need for a financial transaction tax. 3. Not afraid to court controversy – The history of War on Want shows a long list of times when they’ve courted controversy or challenge the status quo, for example questioning the Charity Commission when it questioned the organisations support for the Bangladesh national liberation struggle, or being vocal in its support for the boycott, divestment and sanctions movement in Palestine despite complaints from Conservative MPs and others. It might have been easy for the organisation to accept these criticism and back down, but time and time again War on Want has demonstrated a admirable fearlessness. So Happy 60th Birthday War on Want….here’s to another 60 years. Gollancz was George Orwell’s publisher, but I think he wouldn’t publish Homage to Catalonia because of its anti-Stalin line. Which was odd, because Homage to Catalonia could have been a blueprint for War on Want at its best – uncompromising, committed, brave, radical, unconcerned by fashion, and keeping a sense of humour. Thanks Dave….someone asked me on twitter what I thought your biggest achievement was in the last 60 years. What would you say?